Carrie Hatland lives in Winnipeg, Manitoba, Canada with her husband, two sons, foster sons, and a menagerie of family pets. Carrie’s passion for reading and writing was instilled in her by her grandmother, Ina, who exposed her to the classics at a very young age. Her short story, The MS Lord Selkirk, earned an honourable mention in the 2015 Soul-Making Keats literary competition and placed as a runner up in the WOW! Winter 2015 Flash Fiction Contest. This summer, Carrie was accepted into Yale’s sixteen-day writer’s conference and attended the Writer’s Digest conference in New York. She looks forward to completing her historical fiction novel, Byzantine Dusk. Carrie placed third in our Spring 2015 Flash Fiction Contest with her emotional entry, "The Statue of Laocoön." 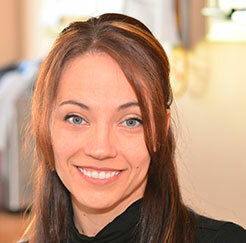 Read the story here and then come back to learn more Carrie. WOW: Tell us a little about the process of writing ‘The Statue of Laocoön.’ The sensory details really made the story come alive. Have you personally travelled to Italy? Carrie: I toured Italy six years ago and, for me, this story started with a sketch. 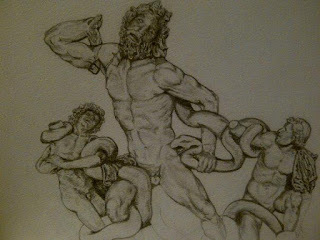 When I was exploring the Vatican museums, I was drawn to the statue of Laocoön and decided to draw the three figures that comprise the statue in my sketch pad. It seemed to me that the sculptor was trying to portray a struggle against death that all of us will face at some point in our lives. If you look at the anguish on Laocoön’s face you will sense a universal human emotion. There is fear, horror that he cannot protect his children, and grief. Laocoön is fighting for his life and losing. In my story, I wanted my character to seek personal meaning in her life. She travels to Italy to find the beauty of discovery and a sense of wonder in the world. I drew upon my own experiences in Italy because I found my time there to be completely enchanting. What surprises me is that the sensory details from that entire trip stand out more to me than the historical sites themselves, which supports the point of Robin William's monologue. To find meaning, you must get out and live. The sketch that inspired Carrie's winning entry. WOW: What a beautiful sentiment! I love how the sketch led to the story. Speaking of being inspired by history, how did you get the idea for Byzantine Dusk, the historical novel you’re working on? How is the process going? Carrie: I was standing in St. Mark’s square in Venice, looking up at the Triumphal Quadriga that sits on top of the basilica. There was a tiny blurb in my tourist book that indicated the Venetians had looted the famous statues during the sack of Constantinople in 1204. Something about that fact niggled and when I got home I began to research it out of curiosity. I found it extremely interesting, and read everything I could find on the Byzantine Empire. As with most topics I get interested in, it had no relevance to real life so I left it behind for a few years. Last fall I was reading ‘The Talisman’ by Sir Walter Scott and the characters and plot for Byzantine Dusk began to emerge in my head. I was compelled to follow the trail of breadcrumbs and begin writing. The process is both exhilarating and challenging. I’ve been going to writing conferences and am currently taking long distances creative writing courses through Stanford, Cambridge, and the University of Toronto in effort to bring Byzantine Dusk to life. WOW: What are some of your favorite classic novels and how have they influenced your own writing? Carrie: I grew up reading Jane Austin, Emily Bronte, Charles Dickens, Edith Wharton, Tolstoy, and Victor Hugo. I’ve found something to love in all of them. In the past year, as I am learning the craft of writing, my favourites are evolving. For example, I am impressed by how Daphne du Maurier wrote the entire novel of Rebecca without ever naming her protagonist. I pull books out of my bookshelf and read the first lines, and was recently captivated by the first line in Pride and Prejudice. I've read these books multiple times, but am now reading them differently. The classics have influenced my writing by instilling in me a love for beautiful prose. My goal as a writer is to share the beauty of words, without letting my readers get lost in the language. I want to paint pictures in their heads as they move forward in a compelling story. WOW: Your acceptance into Yale’s writing retreat this past summer sounds so exciting. What was the experience like? Carrie: The program ran in New Haven from June 6-21. It involved panel discussions with agents and publishers, presentations from best-selling authors, and daily workshops to develop our individual writing pieces. I had the opportunity to take a master class with Colm Toibin, discuss writing with Christina Thompson from the Harvard Review, and attend sessions with speakers such as Cheryl Strayed. To gain access to such highly knowledgeable presenters and hear their opinions on what constitutes good writing was extremely valuable. WOW: Do you have any tips for writers who are on the fence about attending a writer’s conference? Carrie: Yes. Go to them. I haven’t found any one source where someone can go to learn how to be a writer. For me, this process is like a treasure hunt and I never know where I will find the next piece of the puzzle. The information is out there, but you have to search for it. The more sources you explore, the more you learn. Simply put, go. WOW: Thank you again for joining us today and sharing the inspiration behind your writing. We look forward to reading more of your work in the future!